New York Hebrew’s Machon Bar and Bat Mitzvah program has been developed to assist our boys and girls, to transform their ‘coming of age’ into an unforgettable journey. 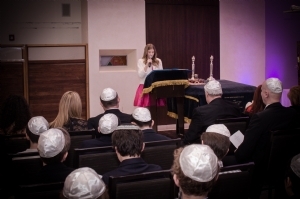 New York Hebrew’s Machon Bat Mitzvah is renowned for its innovative approach, engaging topics, eye-opening excursions, fun social programs, and its unique ability to excite and inspire young minds and hearts. New York Hebrew is well experienced in preparing young boys and girls for this special occasion. We will provide your son/daughter with what s/he needs to be well prepared, have a general knowledge about Judaism and a real positive experience about his/her Jewish identity and Bar/Bat Mitzva occasion. It is advised to start 8 months before the Bar/Bat Mitzvah. Please email info@nychebrewschool.org for scheduling and rates. Our social hall and synagogue affords New York Hebrew families the opportunity of participating either at the public service on Shabbat morning or at a private family service that may be scheduled during the week or on a sunday morning. We take pride in the fact that only one bar or bat mitzvah student participates at a given service. For specific information about planning the ceremony contact our Bar/Bat Mitzvah Coordinator at info@nychebrewschool.org. A date for a bar or bat mitzvah service may be scheduled once a child reaches fifth grade. To contact Rabbi Mendy with whom you can discuss issues related to preparation and ritual, click here.